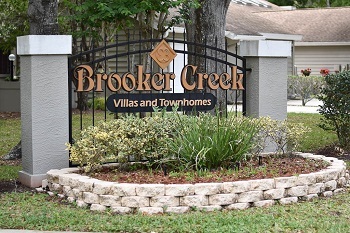 Are you looking for a newer, maintenance free Brooker Creek Courtyard property in the East Lake Area of Palm Harbor, Florida? If you are, you have your choice of a condo, villa or two story townhome. To find these take East Lake Rd to Tarpon Lake Blvd and then to Brooker Creek Dr. Just outside of the Lansbrook community you will be close to Lake Tarpon and the North Pinellas YMCA. The homes in Brooker Creek Courtyard offer gorgeous two and three bedroom floor plans that range in size from 1400 to 1700 sq. ft. Most feature either a one or two car garage, newer appliances and cabinetry and upgraded flooring. Many of these homes offer a waterfront pond view, tranquil back patio, and a community pool to relax and unwind. Enjoy low monthly maintenance fees and all of your yard work is taken care of. This great location is within walking distance to John Chesnut Park, the Pinellas Trail, shopping and dining and lots of areas to walk around without going out on a busy street. Very affordable way to live in the East Lake Corridor of Palm Harbor, you can make these homes a reality! Selling your home in Brooker Creek?